Chile’s answer to Muriel’s Wedding complete with a wedding and decades-old dance music, Gloria, (which was the country’s official Oscar submission for the Best Foreign Language Film category) absolutely shines thanks to actress Paulina Garcia’s alternately charming, bittersweet, warmhearted, wistful, witty yet heartbreaking performance that garnered her an award from the Berlin International Film Festival. Not to be confused with the 1980 John Cassavetes classic starring Gena Rowlands (which in itself was remade nearly two decades later), director Sebastián Lelio's Gloria is a vibrant, compassionate middle-aged slice of life that's centered on Garcia’s eponymous and equally vibrant 58 year old divorced lead. A hardworking yet happy singleton, Gloria spends her days working and checking in on the busy lives of her grown children and her nights living life to the fullest – seemingly just as happy dancing alone to a good song in one of the clubs she frequents as she is dancing with a man who happens to ask. After catching the eye of an attractive stranger who’s drawn to her zest for life and carefree nature, Gloria finds herself suddenly thrust back into the dating scene where sometimes the truth isn’t always what it seems. While everyone in her circle of family and friends seems to be moving ahead and making plans, Gloria quickly discovers that she’s stuck in reverse. Realizing far too late that what drew him to approach her is precisely what sets her apart from everybody else, Gloria falls back on her independent, free-spirited inner-rhythm, knowing that she’s the only one she needs to lead her in the dance of life. A refreshingly empowering message told with maturity and class, Gloria never judges its characters too harshly. More importantly it makes you see the complex humanity in everyone and celebrates its heroine’s ability to (mostly) rise above the fray. A welcome feature that targets a far under-served demographic both in terms of age and gender, Gloria is all the more unique for not putting its character through a traditional Nancy Meyers-style wish fulfillment romantic comedy paradigm for entitled WASPs a la It’s Complicated. While less broadly cartoonish than Muriel’s Wedding could be at times, Gloria's familiar plot points and feminist sense of self-discovery in a non-Hollywoodized three-act structure helps explain why the work was so well received around the globe. Simply put, it's relatable in any language. And because Gloria taps into the same literate, well-cultured, middle-aged female market of women who loan out good novels to one another in book clubs, I think the film is destined to become a bigger word-of-mouth hit as more viewers begin recommending it to their friends. 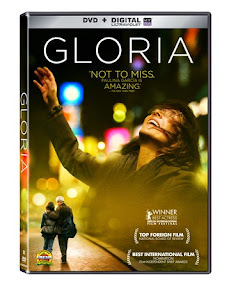 Co-written by the director along with Gonzalo Maza, Gloria is now available on disc from Lionsgate complete with an Ultraviolet Digital Copy that you can take with you to watch after a solo night of dancing on the town.